Whether you’re out for adventure, or just need some extra storage or work space, the Talon’s a great choice. Read a book, call it a day or just kick your feet up for a few minutes in the Talon’s thoughtfully designed bedroom with features like pleated night shades and designer décor. An 18-gallon-per-hour quick-recovery water heater (with bypass system) makes it easy to get ready for, or wash up after, a busy day on the trails or the lake. 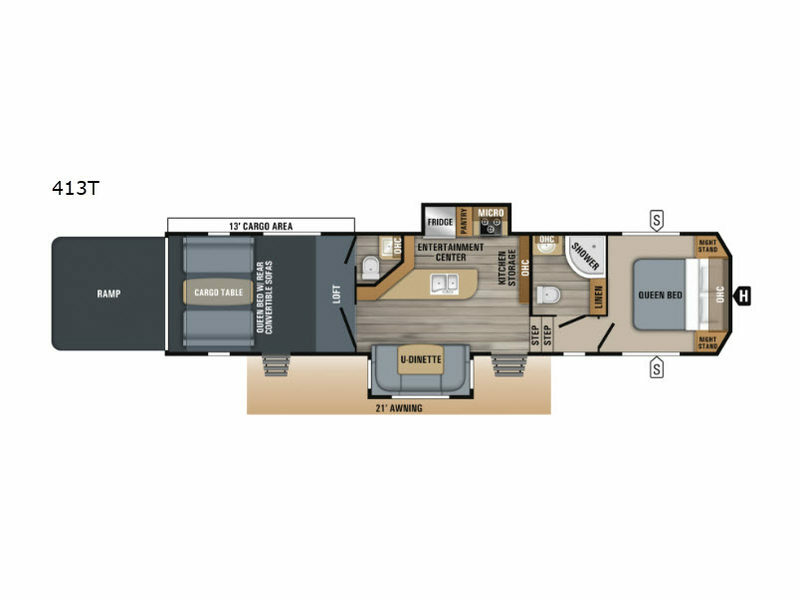 The 393T Talon floorplan offers a nearly impossible-to-find toy hauler option, an outdoor camp kitchen. 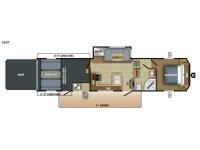 It features a refrigerator, more storage and counter space, a cooktop and even a TV hookup. 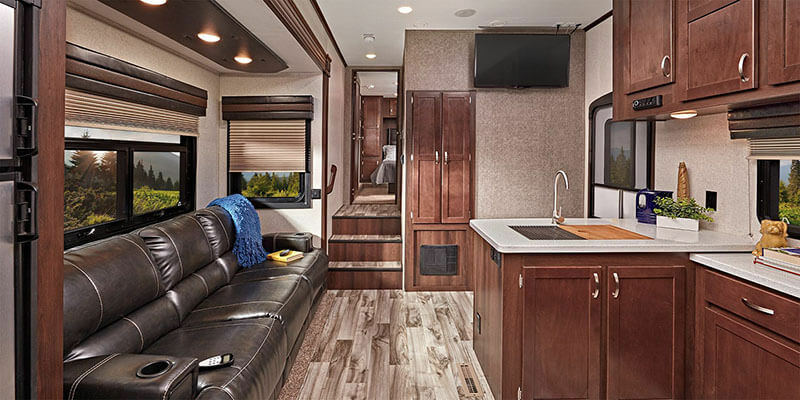 The Talon toy hauler kitchen includes a microwave, decorative back splash, oven, multi-burner cooktop and large sink with cutting board. Popular Talon options include the Super Sofa (select models) with heat and massage and an LCD TV. The kitchen features lots of storage and cabinet space as well as drawers with 75-pound, ball-bearing guides. The Talon’s already-stylish, one-piece painted front cap is accented with LED lighting, as is the power awning. The toy hauler’s rear ramp is available with patio gear. And Goodyear® BEAST tires make the unit ready to roll. 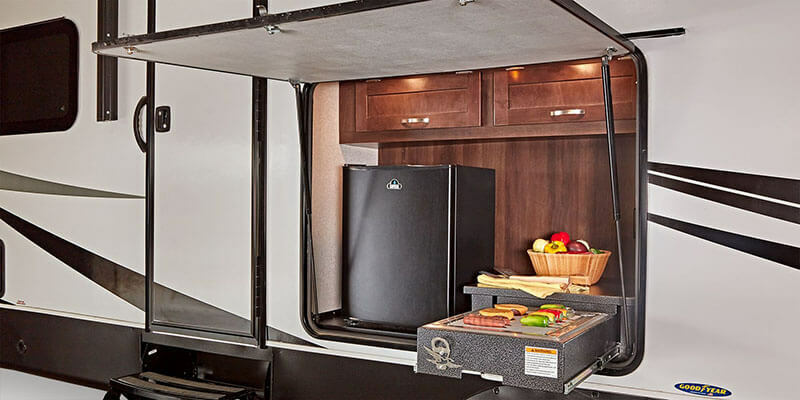 Built on two axles, the Talon features Jayco’s exclusive Climate Shield™ insulation package, and Magnum Truss™ Roof System with 3/8-inch decking on 5-inch crowned truss rafters with R-30 insulation and a seamless membrane. The garage seating efficiently folds away for lots of storage space, while the ramp transforms into a rear patio for more access to the great outdoors, even if the ground is a little wet. 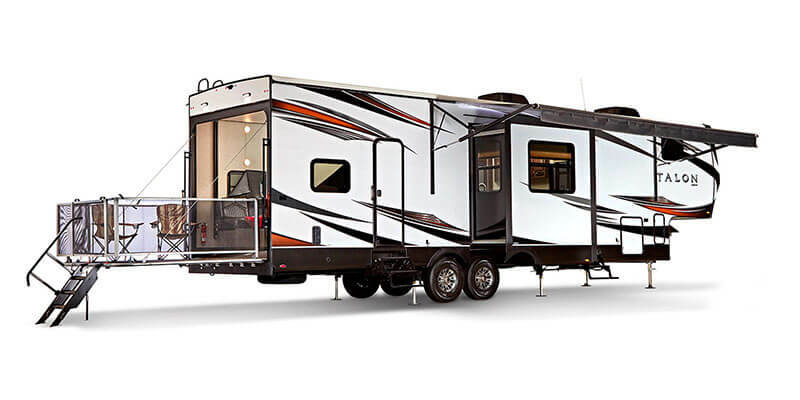 With a rear ramp that doubles as a patio, the Talon toy hauler allows for all kinds of livable space and more access to the great outdoors. 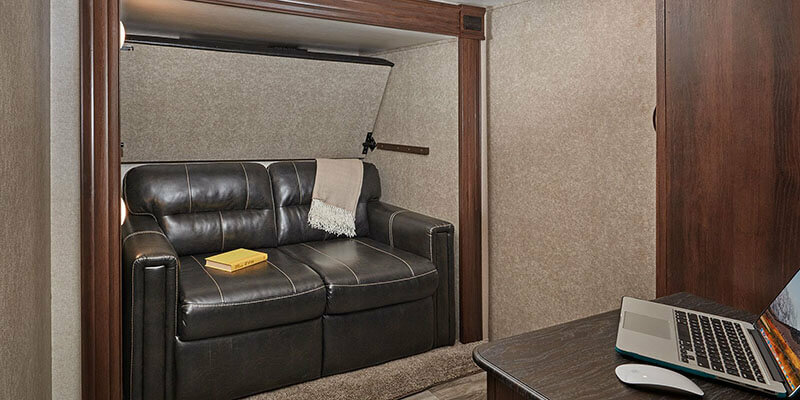 Unique designs, like this bunkroom with its tri-fold sofa, pack comfort and functionality into the Talon toy hauler. 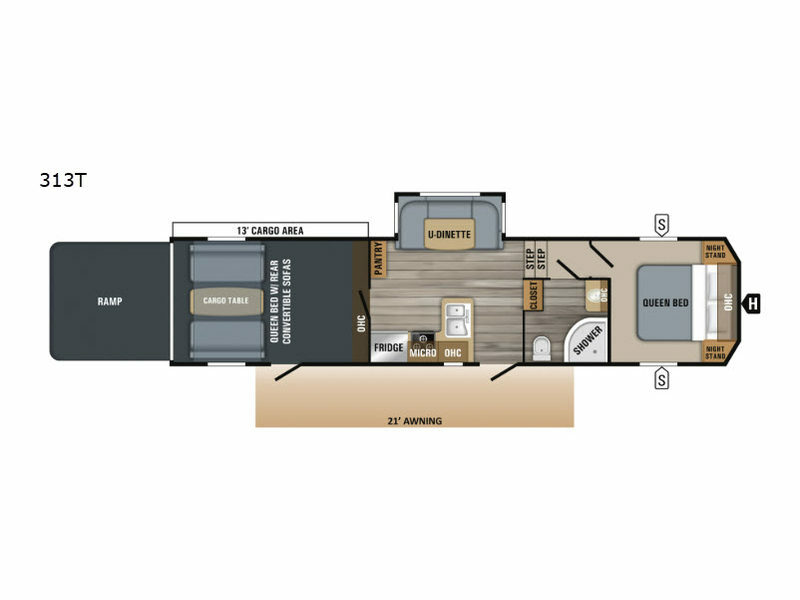 This 392T floorplan features a lofted bunk for additional sleeping spaces. 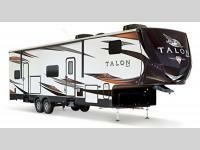 The Talon toy hauler is available with a variety of different sleeping arrangements. Storage space is a main consideration in the design of the Talon bedroom. Deep overhead cabinets and drawers, gas-strutted, under-bed storage and a dedicated hanging closet are among the features built in. The bedroom is prepped for a 15,000-BTU A/C and comes standard with a Jayco-exclusive residential Simmons® mattress. Talon bathrooms all feature spacious showers, lots of storage, power vents and skylights. 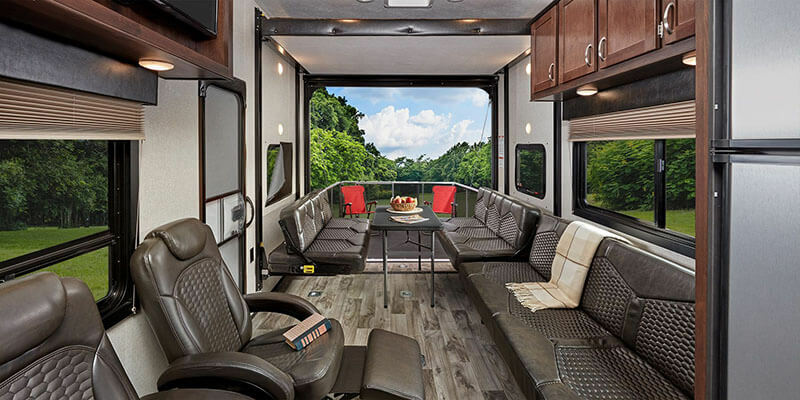 All Talon toy haulers feature at least 13 feet of rear cargo space that easily transforms into a lounge or sleeping area with the help of fold-down seating/bunks. The 413T floorplan provides an extra comfortable and convenient lounge area with an accessible half bathroom in addition to the versatile seating. 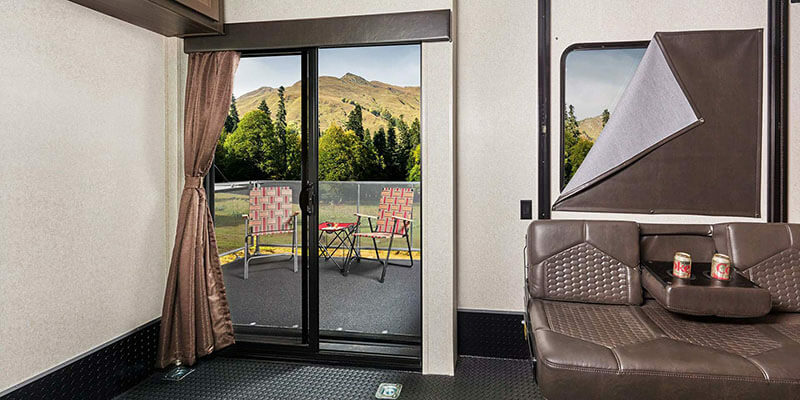 With a 6-point auto-leveling system, an available outdoor patio, a power awning and spacious slide out rooms, the Talon makes for a fun-packed campsite.